We knew very well that the local mobile market is a fiercy-contested stage with top brands dropping their new devices almost every week. And with the surge of these products, we could hardly identify one device from the other. One Cherry Mobile device has been streamlined to have a different kind of camera sensor and that made it standout among its peers. 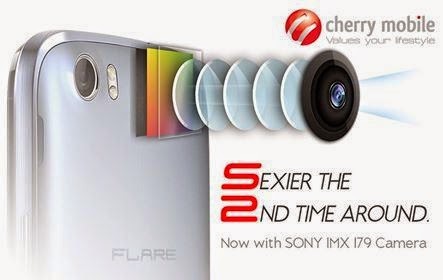 The Cherry Mobile S2 is marketed to have a Sony IMX179 image sensor. This sensor is similar to Nexus 5's 8-megapixel rear shooter. On paper, the Cherry Mobile S2 will have a mid-range display that sums up 4.5-inch screen real estate which is somewhat bigger that its 4-inch predecessor. The panel is rated as an IPS display so that users won’t have any problem with its viewing angles. This FWVGA screen sports an acceptable 217 ppi pixel density. When it comes to hardware, the Flare S2 is still clocked with 1.3-gigahertz quad-core CPU. Though there's no word on the specific processor, however we assume that it'll be an MT6285M variant. The chip will be backed-up with a gigabyte of RAM to keep things smooth fashion. Memory-wise, the Flare S2 will get the usual 4GB ROM and up to 32 gigabyte (expansion option) combo. The secondary camera will be treated with a 2-megapixel sensor. On the radio side of things, the device will have dual-SIM or dual standy capability. Other connectivity options include Bluetooth 4.0, WiFi and HSPA+. No LTE here. Though there's no word about the price, our guestimate will be Php 4,699. In terms of battery, most of us are hoping for Cherry Mobile to include a better rating than just a mere 1400 mAh. 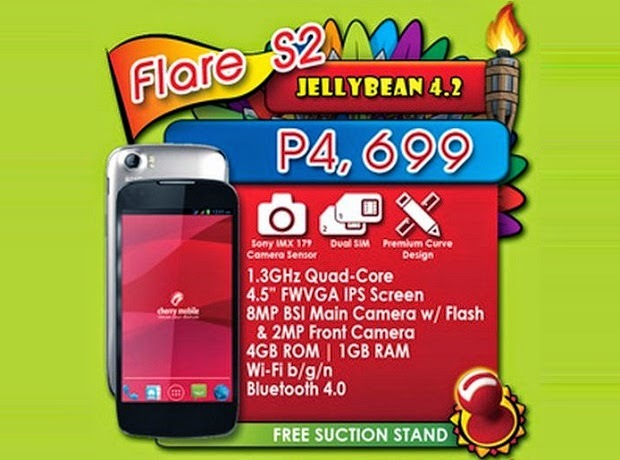 Cherry Mobile Flare S2 carry a Sony IMX179 sensor is, however, another first in the local scene. We always give credit to Cherry Mobile for being so aggressive in pushing innovative technology in our mobile phones.